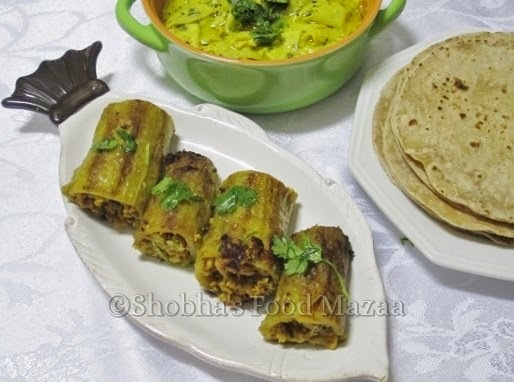 We make Bharwan Karelas / stuffed bitter gourds with many fillings.. Ever tried making them with keema filling.. They really taste delicious. You can make a dry version or even serve them in any gravy of your choice. 3. Now tip in the chicken mince, salt and the spice powders. Saute well until the colour changes.Sprinkle a little water and cook until done on low flame. It has to be dry. Set aside. 4. Mean while scrape the karelas and scoope out the seeds carefully from the two ends with a knife. 5. Boil them for a few minutes adding salt. Drain and let them cool. 6. Fill the chicken mince into the karelas. 7.. Heat a little oil in a flat saucepan and fry the stuffed karelas turning the sides very carefully to a nice golden colour. Serve as a side dish with rotis or dal chawal. For variation you can make a nice gravy of your choice and pour over the prepared karelas. I have made a simple gravy. Blend together, onion,tomato, ginger, garlic, green chilli, few mint leaves. Heat a little oil and cook the gravy on low flame until it changes colour. Add all the spice powders and salt. Place the stuffed karelas in a serving dish. You can cut them carefully into 4 pieces. Pour the gravy on them and garnish with coriander leaves. Wow.. such a nice compliment .. you made my day ! you are pataaka shobha :)such an innovative idea.. hats off to you..
Wow that's a really innovative dish. delicious curry ..Ongoing event : Street Party Food in my blog . 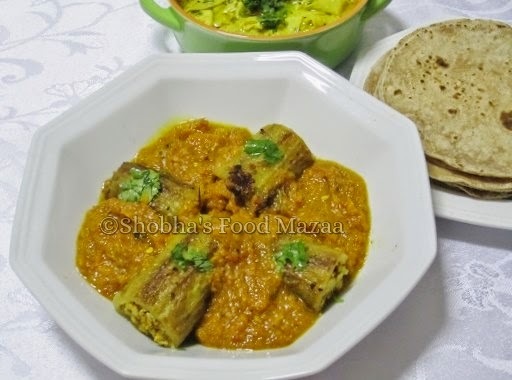 Amazing recipe Shibha.I have made stuffed karelas.But the filling,a mince ? I never could imagine though..It's more than filling.Yummy. Melange, this is very popular in Muslim homes. These look really delicious! Great pics! Unique and flavorful recipe, looks so tempting.